On February 15, 1898, the U.S. battleship Maine blew up in Havana Harbor, Cuba, leading to the deaths of 260 sailors and U.S. entry into the Spanish-American War. 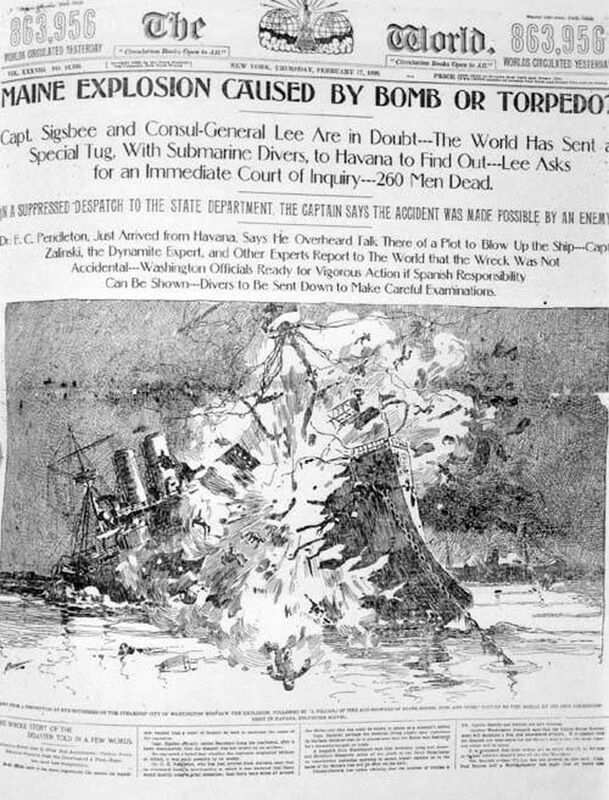 The New York World, published by Joseph Pulitzer, covered the sinking of the U.S.S. Maine with rabid intensity. Although his newspapers openly suspected Spain in the catastrophe, Pulitzer himself said that "no one outside a lunatic asylum" believed that Spain caused the explosion. Image by New York World, courtesy Wikimedia. On February 15, 1898, the U.S.S. Maine blew up in Havana Harbor, Cuba. The Maine was in Havana to protect U.S. interests in Cuba, which included control of massive sugar plantations. Cuba was struggling for independence from Spain, and the Maine also showed U.S. support for the Cuban rebels. About 260 military personnel lost their lives as a result of the Maine explosion. Historians do not agree why the ship blew up. Some think it tripped a naval mine in Havana Harbor, while others think the Maine exploded as a result of an internal fire. person who advocates war or other armed confict. to mediate or modify the outcome of an event. explosive device placed in water, to destroy ships or submarines. theoretical or true in name only (not in practice). large estate or farm involving large landholdings and many workers. person who resists the authority of government. American battleship that exploded and sunk in Havana, Cuba (1898).